The medical journal that published a controversial study linking MMR to autism says, with hindsight, it would not have published the paper. Richard Horton, editor of the Lancet told the BBC the researchers had a "fatal conflict of interest". But Andrew Wakefield, the researcher at the centre of the study, rejected the journal's claims. 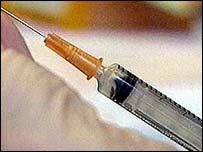 The paper prompted many parents to reject the three-in-one jab, even though most experts say it is safe. The Lancet launched an investigation into the way the study was carried out after receiving "an allegation of research misconduct". It would not reveal who had made the allegations - which do not cover the actual findings of the study. But in a statement, the Lancet said Dr Wakefield had not said he was carrying out a second study into whether there were grounds for legal action on behalf of parents of allegedly vaccine-damaged children. Some children were involved in both studies. The Lancet says it should have been told about this overlap, although Dr Wakefield says he was not involved in the selection process for the second study. Dr Horton said: "There were fatal conflicts of interest in this paper. "In my view, if we had known the conflict of interest Dr Wakefield had in this work I think that would have strongly affected the peer reviewers about the credibility of this work and in my judgement it would have been rejected." He said: "As the father of a three-year-old who has had MMR, I regret hugely the adverse impact this paper has had. But he said: "Professionally, I don't regret it. The Lancet must raise new ideas." However, Dr Wakefield said the Lancet study and his other work were completely separate. He said he believed his findings were still valid. "They have now been confirmed independently by reputable physicians and pathologists." He added: "My colleagues and I have acted at all times in the best medical interests of these children and will continue to do so." "Six years on, the legacy of the MMR scare persist"